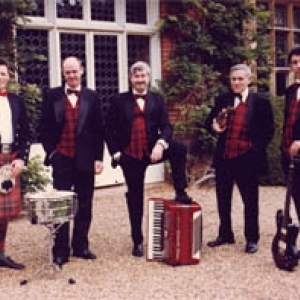 Consisting primarily of ex-BBC Musicians, The Highlanders are a Scottish Reels & Ceilidh Band with a verifiable and unmatched reputation for brilliant, dynamic and professional performances of Scottish dance music for Reeling Balls, Wedding Parties, Burns Suppers and, indeed, all manner of Scottish Ceilidhs and Events. The band’s core musicians comprise Fiddle, Accordion, Guitar and Drums (with the addition of a Caller/MC whenever required). The Highlanders are based in London, south-east England and whilst most of our engagements tend to be in the home counties (Surrey, Hampshire, Oxfordshire, Hertfordshire, Essex, Kent, etc.) we are more than happy to travel further, Cumbria and North Yorkshire - in fact, anywhere we are needed. Whether performing for private parties or corporate clients, for experienced 'Reelers' or complete beginners, The Highlanders are proud of their track record to make a resounding success of every event - without exception.